HTTP/s flood with browser emulation is a layer 7 DDoS attack that targets web servers and applications. A custom-crafted attack using browser emulation can easily be enhanced with form-submissions, mouse movement emulations and other malicious operations that fall under a definition of normal visitor behavior. When a limit of concurrent connections is reached on the attacked server, the server can no longer respond to legitimate requests from other users, effectively causing a denial of service. Similar to HTTP flood attacks it may be quite challenging to differentiate the attack from a valid traffic. Traditional rate-based volumetric detection, is ineffective in detecting HTTP flood attacks, since traffic volume in HTTP floods are often under detection thresholds. Before sending an HTTP request a TCP connection between a client and a server is established, using 3-Way Handshake (SYN, SYN-ACK, ACK) , seen in packets 1,2,3 in the example above. 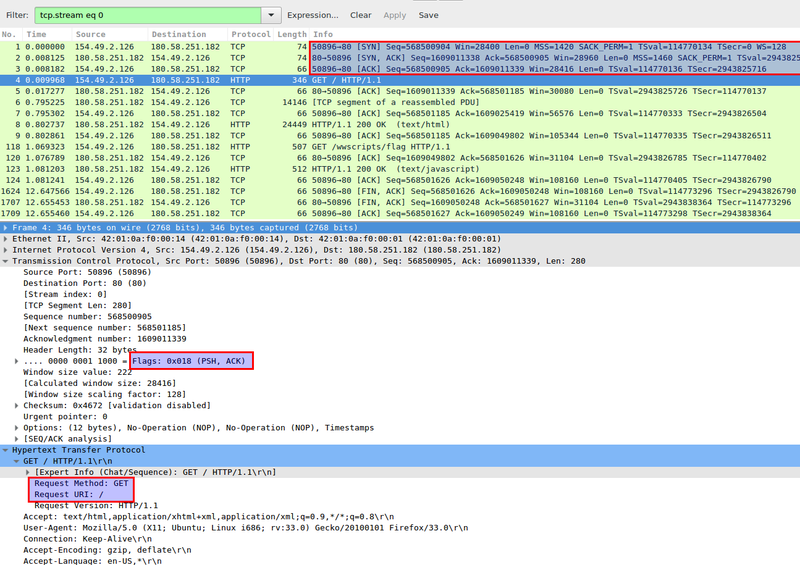 HTTP request packet will normally be in a (PSH+ACK) packet, as seen in packet 4 above. Additionally, the attack can fetch all hyperlinks from the page and start following them in a predefined or random order, leading to a very intense “browsing” of the attacked site. The stats on the image above are shown for a single node single-threaded browser-emulating http attack flooder that was “browsing” a news site for around 1 minute. As one can see this lead to 0.5 Bbit/sec traffic and 90 pps. While during a real attack one should expect those numbers to go significantly higher. 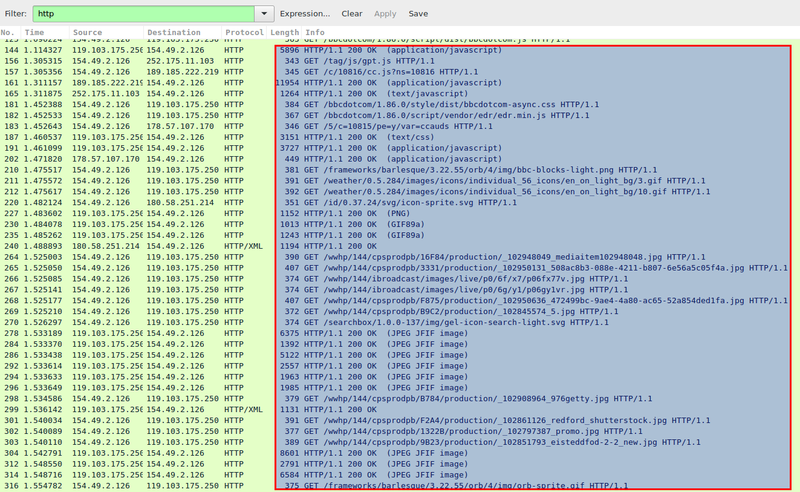 “http” filter – to show all http related packets. “http.request.method == GET” or “http.request.method == POST” – to show HTTP GETs or POSTs respectively. It will be important to review the user agent and other HTTP header structures as well as the timing of each request to understand the attack underway.